My experience at the Beta Kappa chapter of Kappa Alpha Theta has been nothing shy of life changing. From the first day of recruitment to the first pre-Initiation ceremony that took place last week, I have loved every second of my time with Theta, and I cannot wait for it to be part of my life forever. As a sophomore, I had sort of an interesting recruitment process. I was able to arrive the first day with an idea in my head of which organization I wanted to be a part of after being at Drake for an entire year already and seeing all of the things all of the chapters accomplished. For me, there was no question that the place I believed I belonged was Kappa Alpha Theta. I will never forget the way I felt leaving recruitment events at Theta everyday. It was a feeling of home. Since Bid Day, my love for Theta has grown by the second. From Monday night dinners, to Big Little reveal, to formal, to Bible Study, to simply grabbing coffee with a sister, there is never a dull moment, and never a moment where I question whether or not I made the right choice. As I prepare for initiation this weekend, I cannot believe how lucky I am to have been chosen for this sisterhood. I cannot wait until I can wear my letters proudly. ​I have always been someone with very definite plans for my future. Going into college, I never envisioned calling myself a “sorority girl”. All I knew about Greek Life was limited to the things I had seen on TV and my expectations about formal recruitment were solely based on these stereotypes. However, in hopes of finding a support system at Drake I took a chance and signed up for recruitment. This was when my “definite plans” of what my college experience would entail changed for the better. From what started out as a skeptical outlook on what it meant to be a part of a sorority, my mindset had done a full 180-degree turn-around. Fraternity and Sorority Life at Drake is so much more than I could’ve ever imagined. Not only have I found an incredible support system, but I found my home away from home and the women who have pushed me to become the best version of myself while at college. My favorite thing about Kappa Alpha Theta is the fact that each of us are entirely unique but our values tie us to one another. I have relationships with my sisters that I otherwise would never have made because we don’t share the same major or participate in the same extracurricular activities, but because of Theta we were brought together. Theta has empowered me to take risks that I otherwise would not have because of the incredible support system I have that pushes me to be better, and that I know will be there when I fail. There is no hiding the fact that sometimes being a college student is challenging, but my sisters have been there for me every step of the way. Whether it was consoling me when my grandmother passed away during finals week of my freshman year, taking the leap and deciding to go to India over J-Term, or choosing to give back to Theta by serving as President this year, my sisters have never faltered in their support. I have learned a countless number of things from being a member of this organization, but the most important is that I am so proud to call myself a “sorority woman”. Theta encourages its members to be Leading Women, and I can honestly say that it does just that along with so many other incredible things. My college experience would not be what it has been without having each and every one of my sisters being a part of it. Kappa Alpha Theta is an organization that I would have never dreamt of joining when I began looking at colleges while in high school. Looking at school after school had become a chore and seeing the never-ending lists of student organizations and groups that I could join upon entering college had become daunting. I wasn’t even sure of what my major was going to be, nonetheless the groups I’d be joining and the friends I’d be making through them; this task was too big for me. But then I found Drake University. And then I found my major. And then I found my second major. I had gotten my roommate assignment and I could finally breathe. And then I couldn’t. It was time to move-in to Stalnaker Hall, move out of my little house in Streamwood, IL, and become an adult – or so I thought. The girls and guys on my floor were amazing and we all became fast friends. We all sat in a room and talked about where we came from, what our majors were, what our ACT scores were, and what groups we wanted to join at Drake. It quickly became apparent that everyone knew exactly what he or she wanted to join and who they wanted to be; and I had forgotten to decide. So I started tagging along with my friends to information sessions for different organizations but time after time I felt like the odd one out. All of my friends had found where they belonged at Drake, and I hadn’t. My closest friends had all decided to go through recruitment, but that was something I had never dreamt about. Me? In a sorority? Never. They were all super girly and fawning all over boys while painting their nails in all-pink outfits. One thing was for sure and that was that I did not do pink. Was there even a sorority with girls that liked dorky things like me? Who’d rather stay in and eat a million pizza rolls watching a superhero movie? But, with only one opportunity for inclusion left, I thought “Screw it, I’ll go through sorority recruitment. I mean what’s the worst that could happen?” Little did I know that the best thing would. Kappa Alpha Theta was the first chapter that I entered during recruitment, and the only one I had thought about for the remainder of it. I talked to woman after woman and connected with every single one of them. And this isn’t some sort of “Stepford Wives” clone thing. Every single woman was different, from a journalism major who wanted to work for the NY Times, to a computer science major that geeked out at Harry Potter with me, and the two women that nonstop quoted Bridesmaids, Duck Dynasty and Pitch Perfect with me; I just knew it. I had found the place that I belonged. I finally felt safe and at home at Theta. I felt as if I had gotten to actually be and act like myself for the first time in my entire life. I knew that my sisters would never judge me for who I was, what I did and the countless amounts of stupid things that I would say. They would order pizza and watch Harry Potter with me when I was sick on Halloween. We would play Cards Against Humanity and watch Disney movies until all hours of the morning. They would listen to me fawn over the newest superhero movie and tolerate me when I sang the Pokémon theme song during my endless Netflix binges. 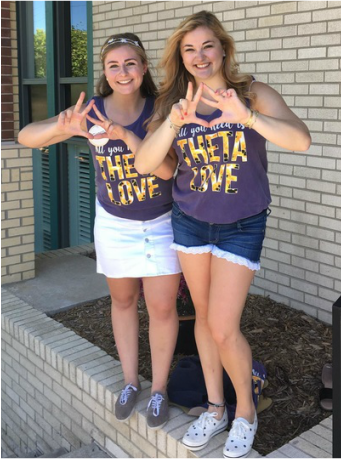 ​Before Drake, and before Theta, I had no idea who I was, but if there was one thing I knew it was that I was not a “sorority girl.” I was scared to admit all of my quirks, hobbies and innermost thoughts in fear of judgment from those around me. But being surrounded by the most amazing sisters in the world showed me what acceptance really means; they showed me who I really was by reflecting little parts of myself in them. I am proud to be a member of Kappa Alpha Theta, and I am proud to be a part of an amazing group of leading women. I’m Emily – I’m starting my sophomore year at Drake this fall majoring in Health Sciences and Neurology. When I came to Drake last year I was completely against Fraternity and Sorority Life and all the drama that appeared to come with formal recruitment. The process sounded scary and kind of made me uncomfortable. I decided to go through recruitment anyway and when Bid Day came around, I joined everyone else is running home to meet my new sisters. Bid Day was a little overwhelming but that feeling didn’t last long. My weekends were soon filled with sisterhood events, Monday night dinners, Sunday chapter meetings, and numerous lunch dates throughout the week with my new sisters. Joining Fraternity and Sorority Life opened up a whole new crowd that allowed me to socialize with girls in different majors that I would have never met without Theta. One of the most meaningful relationships that I have made through Theta is with my big Meghan. I got to know Meghan through several lunch dates and immediately fell in love with her. She reminded me of myself with my “killer” dance moves, awkward encounters with the male species, and love for food. Meghan has become the big sister that I’ve never had. She’s become the girl that I can go to for anything and everything; whether it’s to comfort me when I’m sick, laugh with me about my lame jokes, or be my “mom” when I’m upset with life, Meghan is always there and ready to be the sister I’ve always wanted. Looking back and reflecting on my time so far as a member of Theta, I know that if I had never taken the chance to go through recruitment I would have never met so many of my best friends. I can’t thank myself enough for being brave and courageous by taking the first time to find my home away from home. In high school, I spent a lot of time volunteering with my community. I led various community service groups, volunteered with the bank I worked at, and represented my community at various conferences. When I was looking at colleges, I wanted to find somewhere that I could get involved in the community just like I had been in high school. Drake was the perfect fit for me with all the opportunities for reaching out into the community the University offered. I decided to go through recruitment because I had heard of all the good that Fraternity and Sorority life community could do. I also was hoping to find a sisterhood that would be able to support me all throughout college. Theta was the perfect place for me; I could see the women valued service, sisterhood, and scholarship, which was exactly what I was looking for. During the second night of recruitment, members of Theta told me all about CASA, or Court Appointed Special Advocates, their national philanthropy. They explained that CASAs are people appointed to real cases to help children in the court system. I am studying Law, Politics, and Society in hopes of going to law school, so this philanthropy seemed like the best fit for me. During my first year in Theta I loved getting to know more about CASA. I got to work at our annual event, Cakes for CASA, volunteer with my pledge class, and find new ways to volunteer. Right before school started in my second year, we were fortunate enough to have a CASA come in and talk to us about what she does. I was so inspired by her story that I decided I would contact our local CASA Coordinator to see if being a CASA really would be the right fit for me. Before I could go through the training, they kept asking me if I had a support system that I could fall back on, and I was proud to tell them I knew I could rely on any of my sisters for anything I needed. I was able to go through our training with another Beta Kappa member and another Theta from Iowa State. It was great to see so many of us so passionate about helping kids in our own communities. Today I am still working on my first case, and some days it has been a real struggle. There are days that I get very frustrated with the system or the laws, but I know that I can depend on any of my sisters to listen to me rant while understanding why I still want to be a CASA. Theta has given me more than I could have ever asked for and so much more than I ever expected; no matter what happens between school or friends I know I am making a difference in someone’s life, and I have the endless support of my sisters to help me through it. I spent last weekend in Phoenix, Arizona with 814 other women of Kappa Alpha Theta at our bi-annual Grand Convention. We spent three jam-packed days immersed in all things Theta. Along with six other women from Beta Kappa as well as our two chapter co-advisors, I traveled from the muggy Midwest to 100+ degree "dry" heat. After a long morning of travel, we spent a few quick hours by the pool on Thursday afternoon and then made our way to the conference center to shop around at the Theta Marketplace and meet some members of Theta's Grand Council. We were fortunate enough to meet a 91-year-old volunteer from the Phoenix Alumnae Chapter who was initiated at Beta Kappa at Drake nearly 75 years ago. It was almost overwhelming to know that she once lived in the very same house I live in today and she once attended classes on the same campus I walk around each day during the school year. Friday and Saturday marked the only two official days of Grand Convention and they were full of business meetings, educational breakout sessions, and many speakers including Brooke Johnson, former President of the Food Network and member of Kappa Alpha Theta. Each evening we attended a formal dinner accompanied by some type of program. On Friday night we celebrated the achievements of the numerous collegiate chapters and many alumnae chapters and groups. 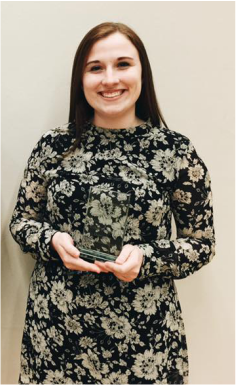 The women of Beta Kappa were awarded two prestigious awards during the night: Excellence in Service and Philanthropy and a Golden Kite Award. Beta Kappa's commitment to service and philanthropy is displayed by our dedication to supporting CASA each fall with a late-night pancake dinner fundraiser and smaller awareness events throughout the year. A small handful of collegiate members have gone above and beyond and become trained CASA volunteers and have become certifies advocates for local abused and neglected kids. The Golden Kite Award was awarded to only 15 of the 147 collegiate chapters across the nation. Every single member of Beta Kappa puts in a lot of energy and effort to making our chapter the best it can be, as well as one of the top chapters of the entire fraternity. On Saturday night we ended the convention weekend with a formal banquet and dinner. Each member is seated with other women of the chapter of which she was initiated. So, the Beta Kappa table seated current and alumnae members who were initiated at the Drake chapter. This was my favorite night of the weekend because I sat surrounded by women who once lived in the same house as I do now, walked the same way to class, and also indulged in Snookie's ice cream which is just a short walk from the Theta house and a frequent weekend destination for Beta Kappa women. It was truly like sitting down to dinner with family. Even though they were complete strangers and at different stages of life than me, it was amazing to witness the bonds of Theta and the legacy of Beta Kappa. If I had to choose one take-away from my time at Grand Convention, it would be that I've now witnessed first-hand that no matter where I am in life, where I live, or how old I am, I will always have Theta's support and unending love. When I first decided to go to school in Iowa, I had never been to Drake or even the Midwest. I knew what moving somewhere far from home meant: I’d only go home and see my family at the end of each semester. I’d done this for multiple summers growing up, spending three months at a time away from home so I figured I could handle four months at school. I realized my first semester that being away from home was easier said than done. College is such a new and exciting time, and it can be easy to forget what you’re missing. But homesickness is very real and it helps to have people you can count on. I participated in spring recruitment my sophomore year and I realized that Theta was the home away from home that I didn’t think I would need. The women of Theta were so supportive and encouraging from the first time I sat with them. When I lived on campus, Theta was a place to get away and find the help that I sometimes needed. The women I’ve met through Theta have become my strongest fan base and most loving support group. I truly have a home in Des Moines because of them. It’s quite special to find a group of women that share your values and who value you as a sister by choice, but that’s exactly what I’ve found in Theta. ​From the moment, I walked in the door during recruitment at Theta, I have been amazed and inspired by the women of the chapter. Learning about how much the women value service, scholarship, and leadership, made me feel right at home. But CASA, Theta’s national philanthropy was what really hooked me. My youngest two siblings are adopted from the foster care system and looking back on their case now, they would have greatly benefited from a CASA volunteer. If they had an advocate, someone would have been their voice in the courtroom as they were too young and had been through too much trauma to speak up for themselves. Unfortunately, however, there are not nearly enough volunteers to fill the need. In Iowa's Polk County alone, only 5% of the cases that need CASA volunteers have one appointed to their case. Knowing facts like these, I knew I wanted to get more involved, but being a 19 year old and a busy first year college student, I needed a push—one that would come from my Theta sisters who have continually encouraged me to go further and make a greater impact beyond myself. During January of my freshman year, I went through the 30 hours of training and was appointed my first case in June. Since becoming a CASA, I have been able to advocate for services for children and fight on their behalf, making sure that their voice is not lost in the system like my siblings had been a few years ago. Through this opportunity, I have been able to attend conferences and meetings where I was able to meet the retired CEO of National CASA, speak with judges, and receive training to better advocate for children and CASA as an organization. With hopes to attend law school with a focus on children’s rights and juvenile law, I would not have been able to see the child welfare system through this angle without Theta. I would not have been able to gain the simultaneously disheartening, valuable, and eye-opening experience, and most of all I would have never been able to make such an impact on a child’s life. Theta’s commitment to philanthropy has pushed me to become an advocate of CASA itself, raising awareness to the necessity of the organization. Many of my sisters have been able to volunteer at the CASA office, and several others have taken the plunge and become advocates themselves, something that I am so proud to say. ​ As I continue in my collegiate experience, the impact that CASA and Theta have had on my life will extend far beyond the next year. Theta has strengthened so many of my core values, and I plan to continue to advocate for children and the CASA program. If I can spread the word and help recruit one volunteer, then my efforts will be well worth it because each volunteer means one more child in the court system with a superhero giving them back their voice and making sure they are both heard and seen. I am a Theta, and I am for the child. ​I have always loved learning. Whether it’s taking an extra history class, figuring out to cook something new, teaching myself how to knit, or exploring a new place, I really enjoy the challenge of the unknown. This passion has only grown deeper since becoming a member of Theta. I remember that I was hesitant but open to the idea of joining Greek life after arriving to campus. I knew that if I were to become a member of a chapter, I wanted to be joining a community where we would support, inspire, and grow alongside one another. One of the reasons I love being a member of Theta is that I am surrounded by women who see each day as an opportunity to learn something new. Intellectual curiosity and personal excellence are not just a catchy phrases that seemed good to put on a website, they mean something much more to us. It would be a lie to say I don’t miss seeing the women of my chapter at Philanthropy events, Monday Night Dinners, or study sessions in Tube but my distance from those individuals have made me appreciate what Theta, as an organization, stands for. Now when I jet set across New Zealand for an adventure, I am not only excited about the journey and new experiences but am reminded of my connection to other women who have felt this same rush. I thought of my sisters and how they supported my decision to seek adventure and study abroad when I went on a weekend sea kayaking trip to Doubtful Sound. I thought of my sisters when I hiked to Tunnel Beach--how half of them would have loved to hike along with me and the other half happy to chat and see the photos without a first-hand nature experience J And every time I walk past the pansies on my neighbor’s porch, I think of my sisters—how their classes are going, if they got that interview they were waiting for, how their spring break was. So even though being abroad this semester has inevitably changed how I can connect with Theta, I haven’t felt disconnected.